Theodore Gericault, 1791-1824, another of France’s famous artists in art history painted one of his most famous paintings "Mounted Officer of the Imperial Guard" in 1812. An admirer of the Baroque art masters Gericault painted a soldier fighting a battle. The officer defends against attack from the rear using a wide, slashing, blow from his sword aboard a rearing horse. 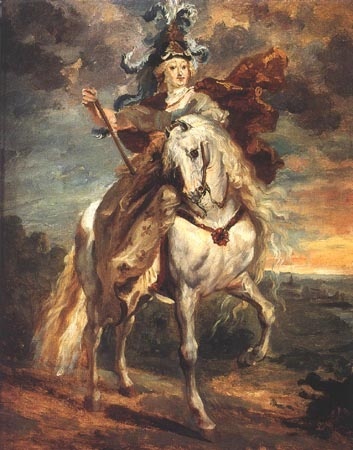 The soldier, the horse and the atmosphere become one dynamism, in the way Peter Paul Rubens painted "St. George and the Dragon". A true romanticist, Theodore Gericault painted expressive character. He did not force emotion on a preset composition. He observed Napoleon's war campaigns and came to believe that violent action was caused by an inner dynamic of the soul. Another of Gericault's paintings "Raft of the Medusa", painted in 1818, was a representation of a current event, contrasting the singularly virtuosic ethical composition of the "Oath of the Horatii" painted by Jacques Louis David in 1784. Each painting was a huge success. The "The "Raft of the Medusa" was a success with the public using sensationalism and sensualism, man against nature to the death or to whatever end. The "Raft of the Medusa" has a triangular and pyramidal figure structure of High Renaissance painting that shows a strong diagonal composition moving left to right following a line of strong muscular bodies. The raft itself was constructed using material from the wrecked "Medusa", a French frigate carrying 149 passengers, sinking off the coast of Africa. Fifteen people survive against a turbulent sea and strong winds. Bodies lie on the raft in all different positions of anguish and suffering, creating tension and sensuous emotion. Through the use of Caravaggesque strong intense lighting, irregular shapes, frayed fabric, and a foaming sea, Gericault increases the height and anxiety of his composition. Preparing the composition "Raft of the Medusa", Gericault sought out the survivors of the shipwreck. He used the actual people of the shipwreck as his models going to hospitals making sketches of the dying patients. Beauty to a romanticist wasn't in perfection; beauty was an expressed emotion that revealed the soul. Expressions of violence related the inner human struggle of the soul is a subject that interested the romanticist. As an infrequent patient to hospitals and mental institutions himself, and an interested observer, Theodore Gericault painted another of his famous paintings in art history "Insane Women", 1822-1823. He became interested Psychopathology as it began to develop scientifically in the latter part of the nineteenth century. Theodore Gericault made many studies of mental patients, believing as many other people did at the time that a person's character was written in their face. Pursuing realism and concern for observable truth, he painted the artwork "Insane Woman". The artwork was a portrait of a mentally ill patient with a lost soul, fearful intense eyes and a distressed mouth. Other famous artists of Romanticism are Eugene Delacroix and Joseph Turner.